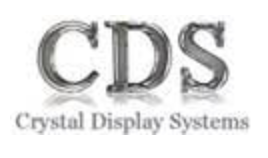 Crystal Display Systems announced an informal CDS Product Day to showcase their team and latest digital displays, touch screens, All in One Touch computers, retail displays, and others. CDS will host their product day in London on November 22nd at the Citadines, Holborn Covent Garden. The CDS team will show visitors the latest as well as talk about the forthcoming technologies and discuss any projects or requirements attendees may have. They can answer any commercial or technical questions and will support visitors in every way they can. Beverages will be served as well. Attendees willl receive a specific discount code for their first order following the product day as a token of appreciation. Visitors will receive this with a CDS USB drive that will also include all the relevant product data from the day.